You have your Masters degree. And your clinical hours. Externships are complete. You’re ready to start your Clinical Fellowship, and be a “real” SLP! And that paycheck is nice too. But the first year can be kind of daunting, especially if you don’t have the support you need. I’ve been mentoring SLPs during their CF for 7 years, and it is amazing to see how much they grow in 10 months. 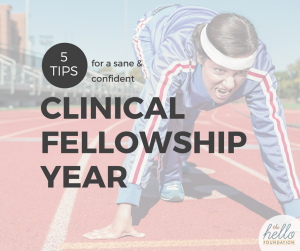 Here are my top 5 tips to get you through your Clinical Fellowship with sanity and confidence. Thanks to Kristina Fassbender, who completed her CF in June, for helping me write this! You are running a marathon, not a sprint. One of my favorite phrases is “I’m not sure, but I’ll find out and get back to you.” No one expects us to know everything, although coming out of graduate school it kind of feels like we should. Use your CF mentor or an online speech group to ask questions about things you are puzzling over. SLPs like to communicate and help – it’s in our DNA! It’s also okay to change things up if they aren’t working for you. Don’t like the data sheet you started out with? Try a new one! Want to shift to quick artic instead of 30-minute sessions? Go for it – you will be surprised at how much independence you have in many aspects of your job. Don’t get sucked into staff gossip. Nod and smile, keep their secrets 🙂 Boundaries are priceless. When overwhelmed, prioritize and simplify. Prioritize by due dates. Keep your therapy plans simple and manageable. Ask your CF mentor or another SLP to help you decide what needs to get done right away and what can wait. If you truly do not have enough time, it’s time to have a conversation with your supervisor about what you can and can’t accomplish in your job. You might be the only one in your building who knows what you do. Speech and language can be abstract, and staff doesn’t always understand why students come to speech. It’s okay. We can educate staff by giving them specific strategies to try with students. It also helps to refer to language-based skills that staff members can relate to. For example, teachers can relate to classroom skills such as “following directions,” “story comprehension,” and “answering questions in class” better than “receptive language” or “verbal reasoning.” Use skills they see in their classroom every day to discuss students, and together you can problem solve how to best support them. You’ve got this! And believe it or not, in a few short months you’ll be signing off on your paperwork and receiving your Certificate of Clinical Competence in the mail. Good luck out there!